In December 2018 we released version 2.0 of our cloud software "target Campaign Management". The daily users of our software benefit from an improved user interface with new collaborative features. By adding self-registration combined with the ability to edit ones own profile as new features, you can now let external users take part in your campaigns. 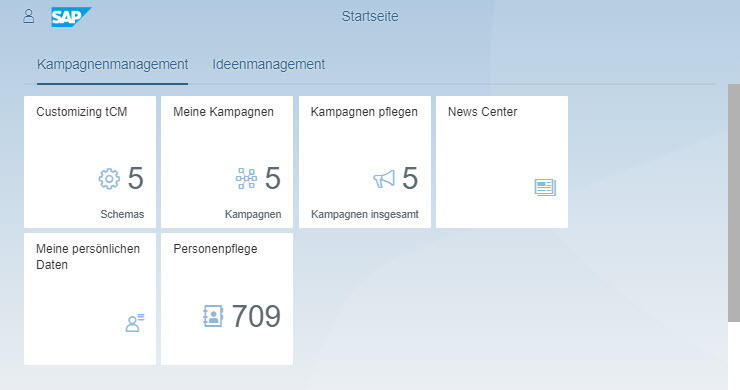 For SAP SuccessFactors customers we offer new integration capabilities which, among other features, allows the application to be started straight from the SuccessFactors homepage. To enable truly everyone to take part in your campaigns, our software now supports user self-registration, combined with an intuitive self-service (to add a profile picture for example). On top of that, you can add terms and conditions that every user has to agree to, before using the software. Your choice of an identity provider combines with our flexible roles that can be defined individually for each campaign, ensuring that every user only has the permissions they are supposed to have. If you are a SuccessFactors customers you can now assign employees to campaigns using the synchronized organizational structure. This functionality is just as flexible as it was in version 1.0 with the organizational structure synchronized with a SAP HCM system. Thus you can future proof your campaign management by connecting to several HCM data providers. Users of our campaign management software can now edit and improve their ideas. Any comments and discussions on edited ideas are clearly and transparently marked to show if they discuss an older version of the idea. It is now possible to add pictures as well as comments to any idea discussions. We have made creating and editing a campaign easier. To ensure an attractive landing page all campaign pictures are now cropped transparently to the correct size. Also the text and background colors of campaigns can now be set. There are many more changes that have standardized and improved the user interface. There are numerous technical improvements below the surface. To delight our mobile users, many data transfers have been reduced considerably. Our reward: target campaign management version 2.0 has also been certified as "Built on SAP Cloud Platform" on December 14, 2018. The certification process contained a technical analysis of our developments, as well as of the integration with the SAP Cloud Platform and was tested with an extensive catalog of test cases. More information – and our contact details – can be found on our product page.